Tag line: "3000 miles of terror!" Of all the gifts I received for Christmas 2013, my favorite is the Alfred Hitchcock Masterpiece Collection, a Blu-Ray set featuring 15 of the master’s films, including classics like Shadow of a Doubt, Rear Window, Psycho, and Frenzy. 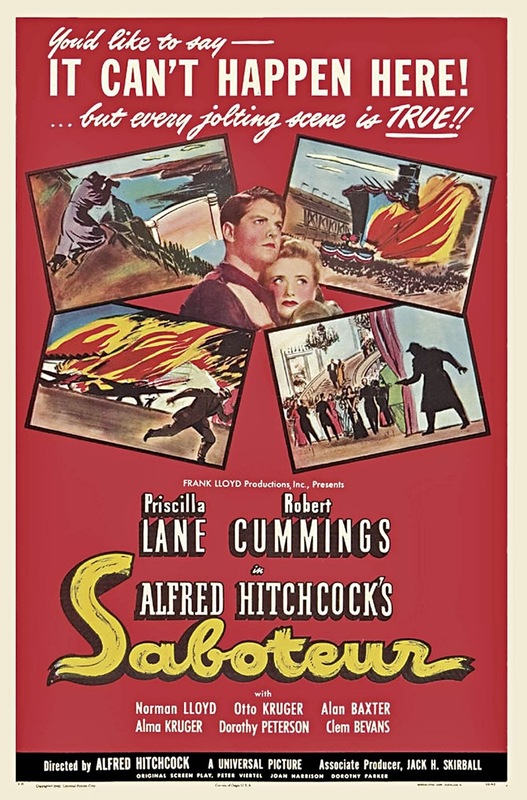 After showing my son a few of the more intense scenes from The Birds, I closed out my Christmas night with a fresh viewing of 1942’s Saboteur, a movie I hadn’t seen in about 25 years. Filled with intrigue and excitement, Saboteur is a whole mess of fun. Barry Kane (Robert Cummings) is an innocent man accused of burning down the California aircraft plant he works for, an act of sabotage that also claimed the life of his best friend, Ken Mason (Virgil Summers). After eluding the police, Kane begins a frantic search for the real saboteur, a man he knows only as Fry (Norman Lloyd). His pursuit will lead him to one Charles Tobin (Otto Kruger), a well-respected businessman who, in reality, is part of a spy network trying to disrupt the U.S. war effort. With the help of Pat Martin (Priscilla Lane), a young woman he meets along the way, Kane heads to New York City to prevent yet another act of sabotage, and ends up in a fight for his life at the top of the Statue of Liberty! Produced while World War II was raging overseas, Saboteur has a handful of overly-patriotic moments (at one point, Kane says “The world is choosing up sides, and I know which side I’m on”), yet never once does it get bogged down by its own propaganda. At times a funny film (early in his search, Kane visits the circus, where he encounters conjoined twins who aren’t on speaking terms with one another), Saboteur also has its share of electrifying scenes, like the shootout at New York’s Radio City Music Hall and the grand finale at the Statue of Liberty, to keep you poised on the edge of your seat. 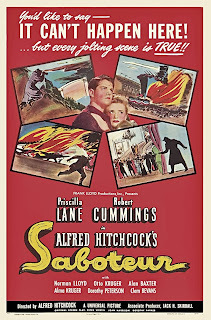 In many ways a precursor to North by Northwest (a man caught in the middle of a politically charged situation travels cross-country to prove his innocence), Saboteur is a highly entertaining motion picture that, after 70 years, still packs one hell of a wallop. I love this movie; it moves at a fast clip and is never boring. So many great set pieces and terrific Hitchcock touches. There is a scene near the beginning of this film--where a guy is a victim of a terrorist act (sabotage). For it day--and even now--it was and is a most horrifyingly effective special effect.